Devoted Quilter: Wedding Quilt Top Finished!! In what has to be a record for me, I have the Irish Chain wedding quilt top finished! Rather than adding a plain border, I extended the pattern into the border by 1/3 of a block on all sides. I like how it changes the look of the quilt. 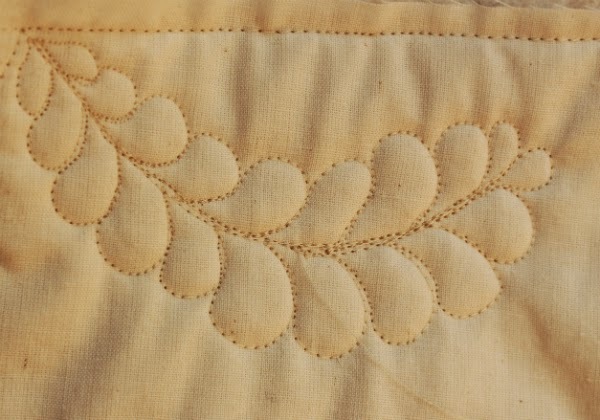 Here is a close-up of one nine-patch block. I love the multicoloured print from Northcott. It looks like feathers swirling around! In the interest of moving right along, I have the quilt basted together and I started quilting it last night, but my machine was giving me fits. The thread kept breaking and I couldn't figure out why. I'm using the Connecting Threads 100% polyester cone thread, but I've used that enough now that I was pretty sure it wasn't an issue with the thread itself. I changed the needle, cleaned the lint out of my machine (which it desperately needed! ), even wound a new bobbin, but nothing worked. Then I took some scrap fabric and batting, adjusted the tension and tried that (even though I've always done fmq at the same tension). Because if you're going to be troubleshooting, it might as well be pretty! So I put the scraps aside and tried the quilt again. As I was getting the quilt into position, I heard it bump the cone of thread, which I had set up directly behind my machine, and I had a little lightbulb moment...The part of the quilt that was behind the machine was pressed up against the thread, which then couldn't feed off the cone properly, which created too much tension and snapped the thread! All the other projects I've done with this thread have been smaller (as was the scrap I used for troubleshooting), so I haven't run into this problem before. I moved the thread cone to the side of my machine and I had no more problems. So, whether it was the tension or the quilt pressed against the thread, hopefully when I start quilting again tonight things will go more smoothly and I can get more done than I did last night! Hooray for finding the problem. I started out only quilting on very large quilts so did not realize how much fun it is to do a small one until I started QAYG. I've had that issue before - I was using a cone to piece and it was caught against my machine by something so it was winding off the spool unevenly. My tension would get super tight and normal again. The spools are great because they are cheaper and last forever, but watch where you set them! Congrats on the finished top and on finding the solution. I never thought about it before, but I always put my cone to the side before. Probably a good thing. What great troubleshooting! My tension problems usually end up with me in tears because I am so bad at adjusting it! Congratulations on the finished green top! 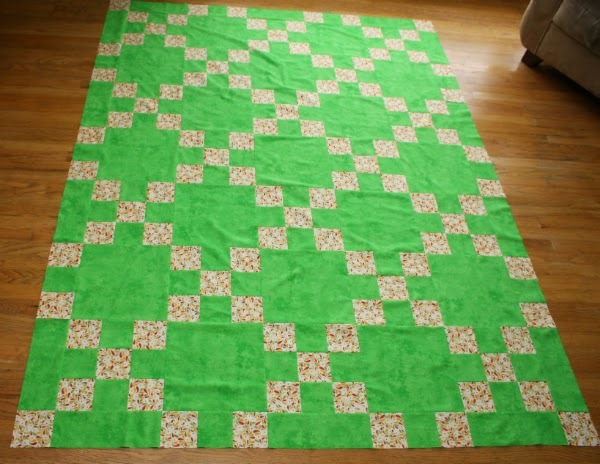 Your quilt top looks lovely, and how good that it was such a simple fix for your tension problems in the end. What a gorgeous quilt top, Leanne! Love the combination of the print and solid you chose. Hope all goes as well on the quilt as it did on the sandwich. Your feathers are so pretty! Very pretty top and glad you figured out your quilting issue too. Isn't it great when that lightbulb moment happens?!?! You were lucky, my moments of clarity usually occur days later. Your FMQ skills are very impressive! 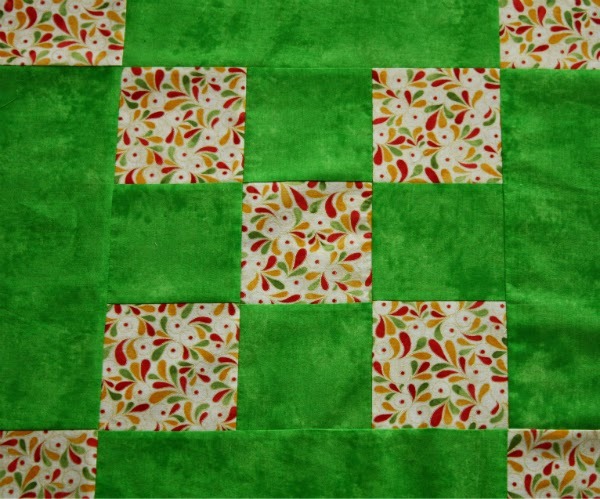 Beautiful quilt, I love the green background. I am glad you figured out the thread issue too. Woohoo! Glad you were able to figure out the issue! Look forward to seeing how you quilt this quilt! Good troubleshooting. Sometimes the cure is only a "lightbulb moment" away. Lovely quilt. It is not always the machine, when we have tension problems!! But it costs a lot of time to solve the problems. Love the effect of the border. Wonder what will be the effect of a second border. Having said that, your topper is a topper!!! I love it.